I think Kimberly jinxed me by complaining that I always get to write the glamorous entries in the blog. Our return to Bimini was supposed to be an exploration of all the wonderful dive sites we had seen when we first came to the island group in 2001 aboard a Black Beard dive boat. We had memories of warm waters, smooth seas, and beautiful sea life. It was also our first time living aboard a sailboat, which sparked something in both of us. 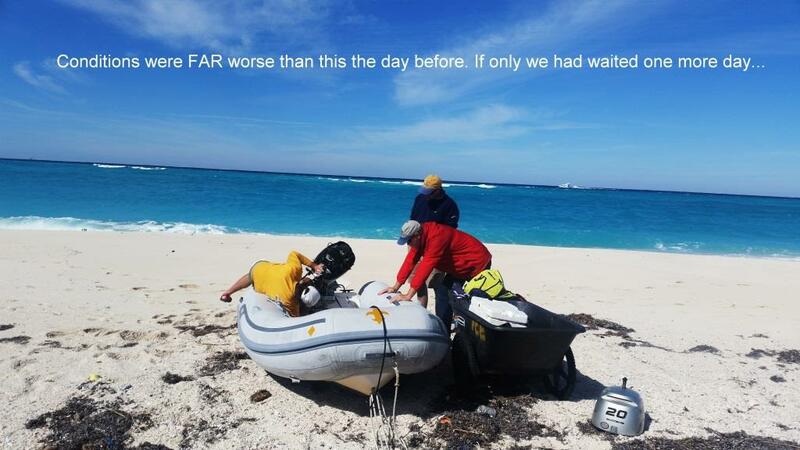 Our return to Bimini was quite the opposite. 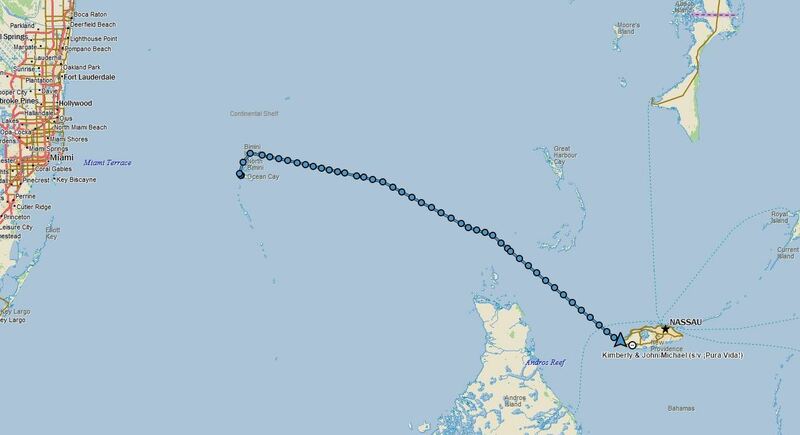 We crossed the Gulf Stream successfully from Florida to Bimini, but the winds were such that we had to motor sail the whole way, and tack to avoid being taken too far north and missing the islands altogether. We went ashore the following morning to clear into the Bahamas at the Customs and Immigration offices. 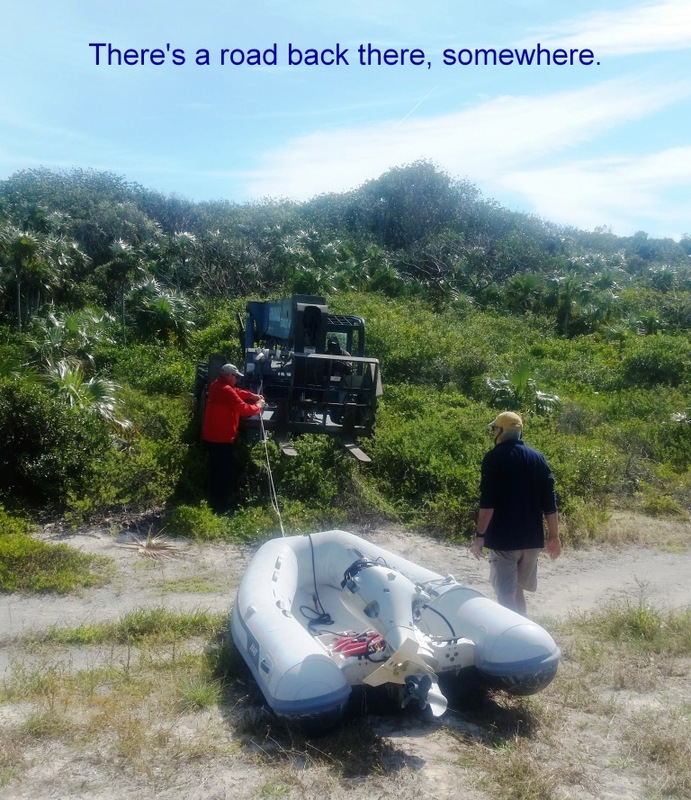 From everything we had read, the process required the captain and crew to go to land to clear in person, so we beached our dinghy with our bikes and headed for town. Nowhere did we read that your boat was required to dock, not anchor, in order to complete this process. Fortunately the Customs official was very kind in advising us that, next time, we really need to dock the boat in case they want to inspect it. The Immigration officer, however, was not so friendly. His sense of humor was non-existent, and our attempts at levity were met with a cold stare. He asked how he was expected to inspect our boat at anchor; “by walking on water?” he asked sternly. He also seemed personally offended that I completed my immigration form in red ink – using the only pen they made available – and made me complete a new one. Just when we thought we were going to have to go back to the boat to relocate so he could inspect us, he took pity on us and stamped our papers. Once cleared into the country, we had to seek shelter inside the narrow bay to avoid a passing front that was kicking up winds above 30 knots, and turning the seas into a foamy mess of choppy waves. The Bay in Bimini has room to anchor, but the swift current ensures your boat changes direction four times a day. When the winds and the currents are from opposite directions, the boats at anchor do a strange dance in semi-circles, moving as fast as 2 knots while anchored. 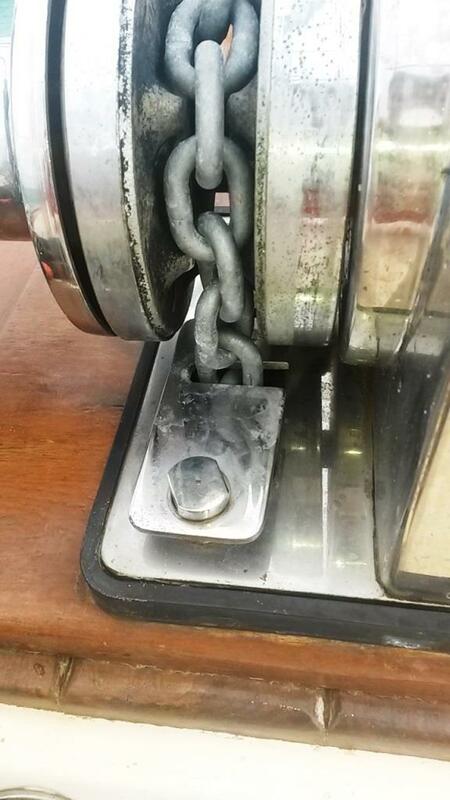 When the anchor chain gets fully extended, the boat jerks violently and starts moving in the opposite direction. What’s even more disturbing is that all the boats seem to do this dance unsynchronized. Every boat was heading in a different direction at the same time. It resembled the amusement park ride “Scrambler” where you think you are about to hit the incoming boat, just to do a fast pass a few feet away with everyone holding their breath with fenders at the ready. 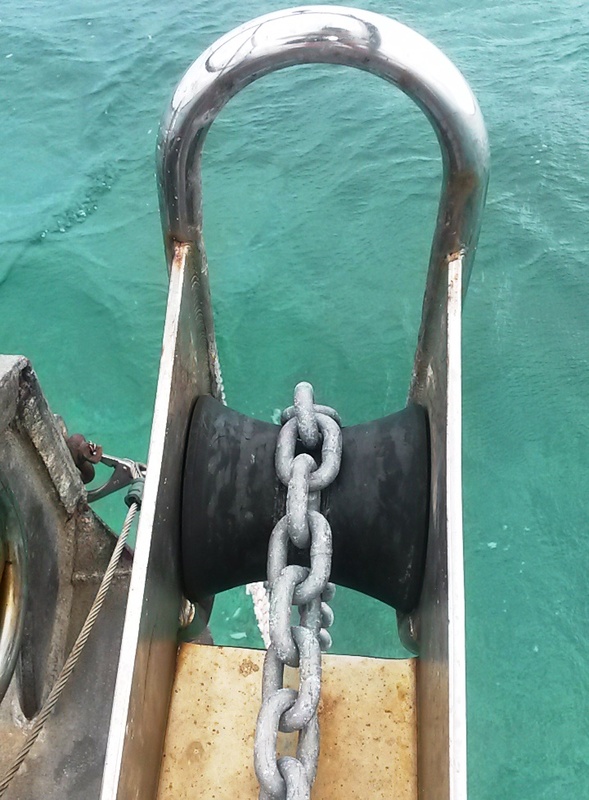 The pitching was so severe that our snubber came loose from the anchor chain. The snubber is a rope bridle that secures the anchor chain to the bow to absorb shock, and take pressure off the windlass (an electric device with heady-duty gears to pull in the anchor chain). With the snubber not doing its job, the chain was pulled so hard that it dug itself into the rubber roller, twisted a heavy-duty steel plate that locks the chain in place, and bent the steel bolt securing the roller. 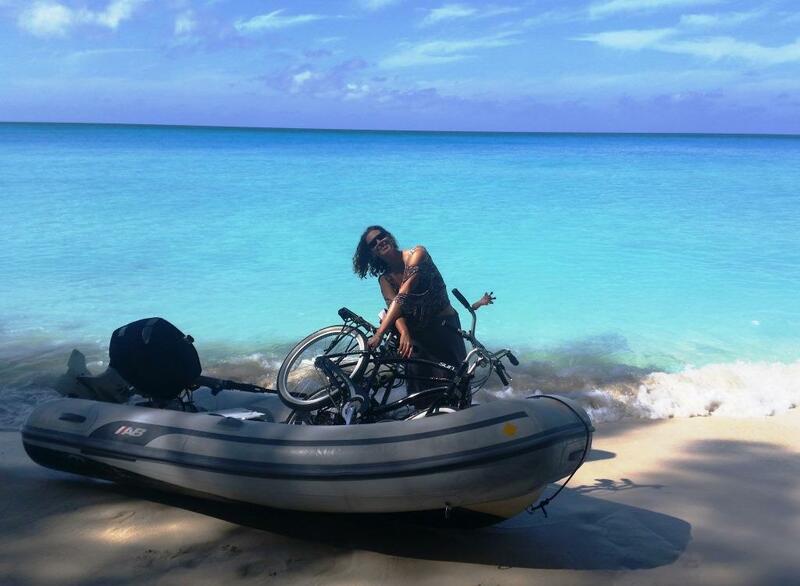 During the three days we were stuck at the Bimini Bay anchorage, we went bike riding to explore the island, but it is a small place, and after three days with sleepless nights on a gyrating boat, we were ready to move. Our haste lead us to make one of our dumbest decisions so far. The weather forecast called for calming winds and seas, and the conditions inside the anchorage seemed to match the forecast. We decided it was time to head out four miles to a nearby cay where we could anchor and explore a new place. 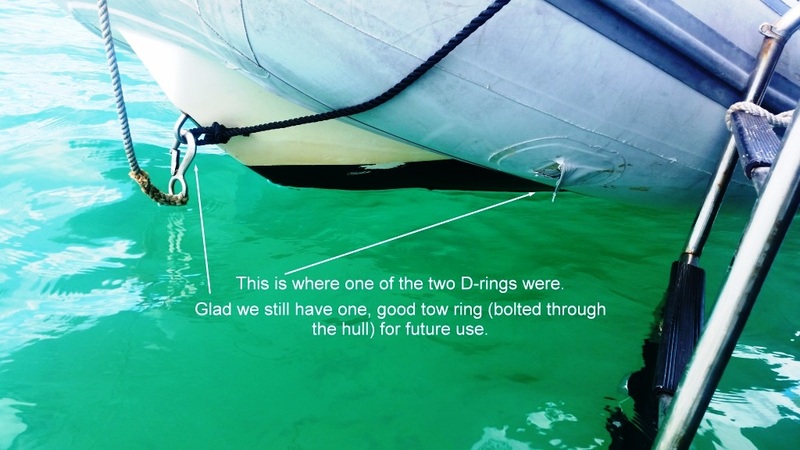 Lured by the anticipated calm conditions, we pulled the dinghy using a tow line instead of raising it out of the water on our davits. This was the second dumb decision of the day. 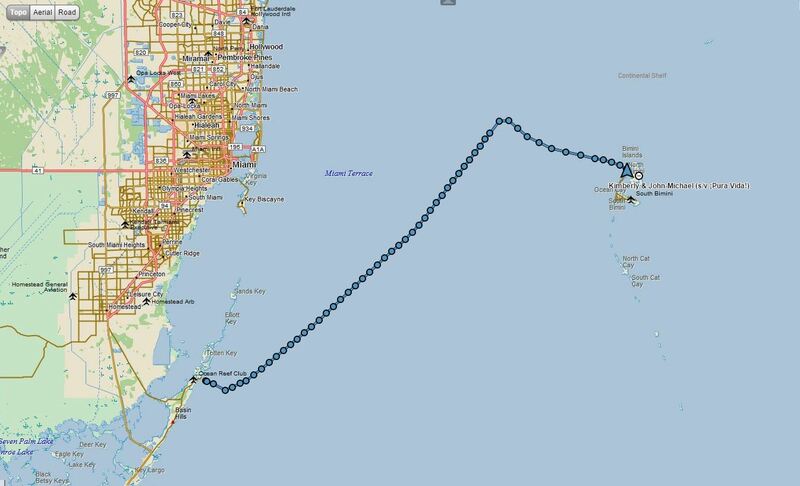 When we entered the narrow channel to exit Bimini Bay, the full force of a 30 knot wind hit us. The waves were crashing over the reef on all sides. Since we knew our boat could handle the waves, and turning around in the narrow channel in these conditions was dangerous, we kept going. We were making headway and had almost reached the safety of deep water – where the seas were much calmer. That’s when it happened! Our dinghy, Lagniappe, flipped upside down in a big wave and the stress ripped the tow line hook-up points. We both looked in shock as Lagniappe drifted backwards away from us with its hull to the sky and motor submerged. 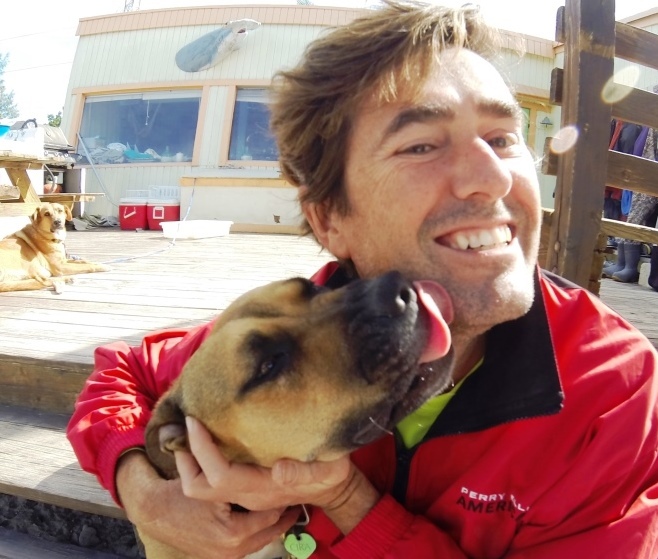 We realized that she was very likely going to get washed ashore nearby, and there was a chance we would get her back. We pulled in the loose tow line to prevent it from getting caught in our propeller. We then waited until Pura Vida was in deep water where we could time the waves and make a safe 180 degree turn to head for a nearby marina. The marina entrance is extremely narrow with rocks on both sides. With the seas raging into the small opening, entering the marina was going to be harrowing. The only way to avoid the water from rushing from behind and creating a reverse steering condition that would surely send us into the rocks, was to enter the tight cut at full speed. I’m sure it only took a few seconds, but time slowed down and I watched in slow motion as we were jerked from side to side, and I steered madly to keep us off the rocks. Once we entered the marina, our friends on s/v Island Spirit, who had been at the marina for a few days, ran out to help us secure Pura Vida to the dock. This was an experience we never want to repeat, and we are lucky we made it to safety with our boat unharmed. Once we got over the adrenaline crash, and shock of the situation, we headed for the beach to look for Lagniappe. We spotted her still afloat and upside down a few hundred feet from shore. When she got into the surf, our friends helped us flip her over using the force of the waves, and got her up the beach and tied to a tree. 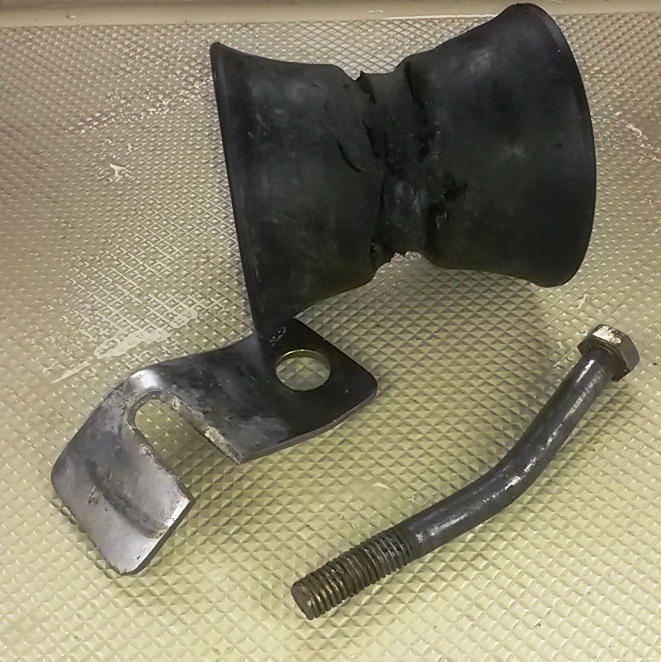 We were surprised that the outboard, battery, lock box, and gas tank were still attached. Amazingly, the only things we lost after a couple of hours of bobbing in heavy seas and being crashed ashore were an oar, a pair of water shoes, a water bottle, and our pride. All this happened late in the afternoon of Super Bowl Sunday, so getting a vehicle to pull Lagniappe from the beach to where we could rinse the motor with fresh water was not likely. 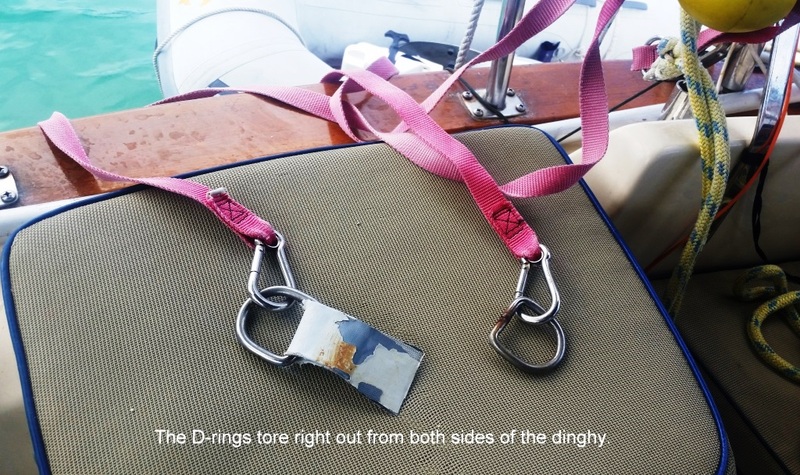 We went to bed that night knowing that with every passing moment, rust and corrosion were starting to build inside the outboard motor and would make saving it harder. But we were too exhausted and emotionally drained to do anymore that night. The next morning we went back to the beach to pull the spark plugs and spray the motor as best we could with WD-40. 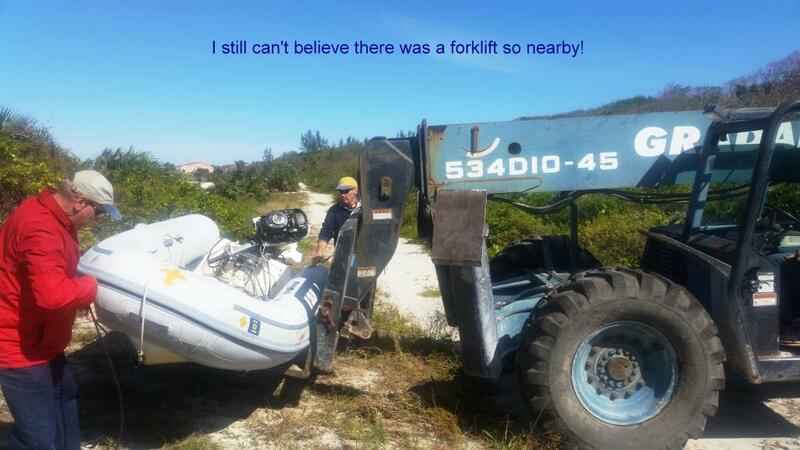 While we were doing this, our friends arranged for an off-road forklift to tow and lift our little boat back to the marina. An off-road forklift! Right near our marina! What are the odds? We are forever grateful to our friends aboard Island Spirit, because we could not have done all this without them. The following Tuesday really added to our Bimini blues. It was Mardi Gras. Not just any Mardi Gras, but our first one away from New Orleans since we started cruising. We tried to enjoy the day vicariously by watching all our friends post amazing pictures of their fun on Facebook, but that just made us miss it more. So, instead of revelry in the streets of our beloved city, we spent the day cleaning a carburetor and getting the boat ready for the upcoming 110 nautical mile, overnight passage to Nassau. Oh yes, and we drank a lot! Bimini was not all bad news. We had fun experiences on land and met some amazing fellow cruisers. 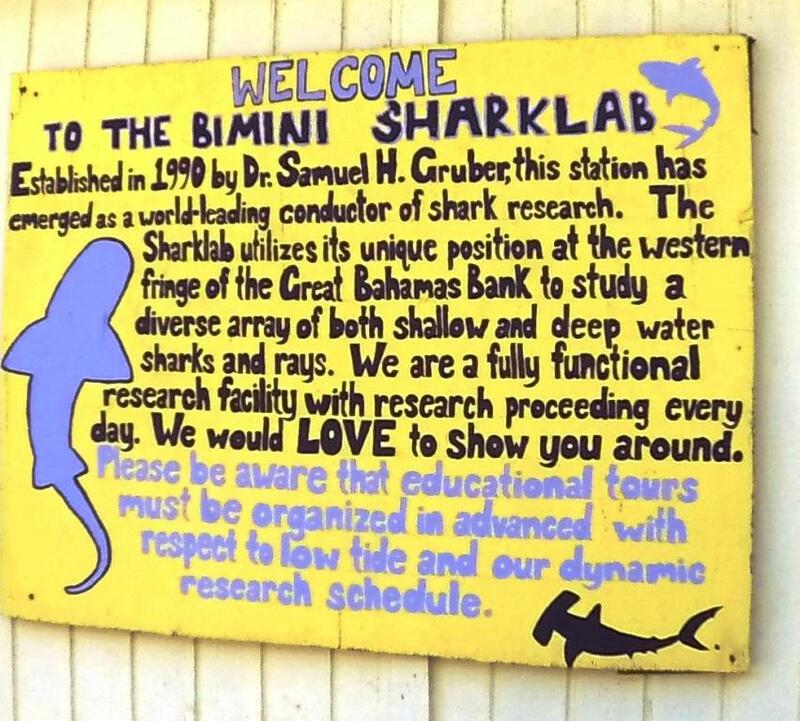 The highlight of our land exploration was touring the Bimini Shark Lab. This is a scientific station that conducts research on shark behavior. 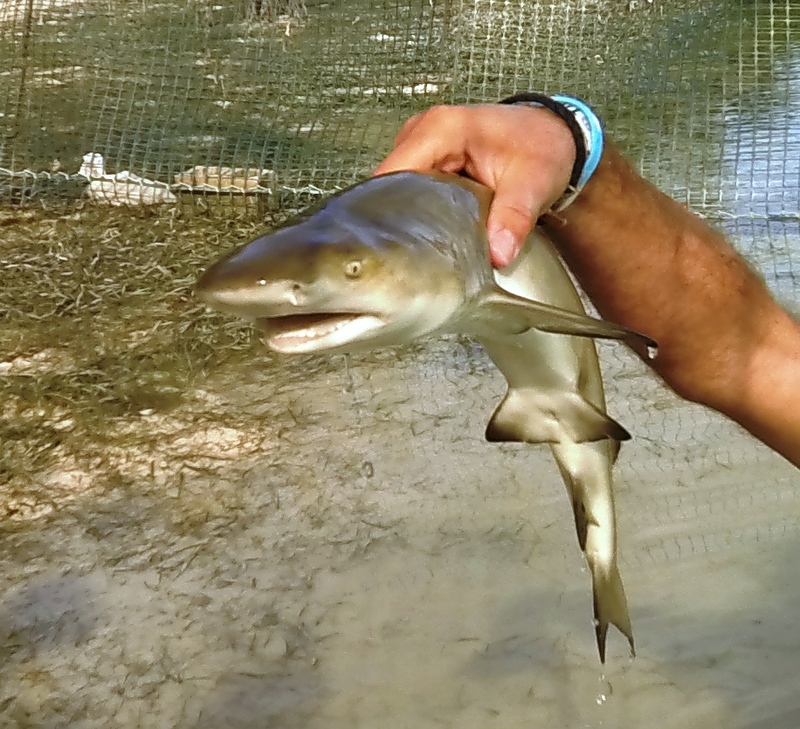 They currently have several studies underway that will help protect sharks and their habitat. We also met Hayden and Radeen on s/v Island Spirit and their friends Jeff and Sharon. They were our saviors when we lost our dinghy. Hayden and Radeen run the association website for all the Island Packet owners, and have been a great source of advice as we prepared our boat. It was a real treat to meet them in person. The other exciting event that happened while in Bimini is that we finally sold our house in New Orleans! This was the last thing tying us to land – and putting a huge dent in our cruising budget. We are now free to roam about the oceans with literally everything we own aboard Pura Vida. The feeling of relief and freedom that this sale gives us is remarkable. The sale of our house punctuates our departure as a long-term voyage, and dispatches any feeling we had that this was a temporary vacation that would soon end. We left Bimini the next day and completed an overnight passage on a moonless night in calm seas to Nassau on our way to the Exumas. We left Bimini humbled, elated, grateful, and looking toward the future. We are so happy we were there to help and that we all met up. You both are to be commended for tearing down that outboard and getting her running all on your own. That is fantastic. Great summary, we read it with chills as you entered the cut because we watched you motor in. That was very very rough. Hugs to you both, we sure cant wait to spend more time together. Wed, we run to Highbourne, then Thru Warderick or Black Point with great sailing winds. We’re leaving West Bay for Highborne tomorrow as well. See you there! Wow what a story! We missed y’all at Bacchus and of course on Tuesday, but so glad you are doing exactly what you’re doing. I’m trying to learn as much as I can from your posts. An adventure for sure … one of many, many more to come. Hardly know you John- Michael, and I’ve never met Kimberly, but I’m loving the hell out of your posts. Living vicariously is almost as good as living! Great, scary boat story! I firmly believe that I never learned a valuable lesson by doing it right the first time. You guys stay safe and we hope to catch up with you soon. Hi Kevin and Maryliz. Glad you like the post; it was not one of our better days, but we learned a lot. As far as things that we would bring or not bring, here’s a short list. We purged a lot of stuff before leaving, so there is really nothing major that we do not use or feel that we should have left behind. We also learned from a couple of circumnavigators that a boat stamp with your boat name, MMSI, type, length, and registration number can be handy to clear into some countries. Just reading your post! What an experience. Thank you for sharing. Makes my Saturday canoe trip to see how our wetland restoration is going seem so ho hum. Wishing you safety as you learn from your experiences. Let ‘er happen captain! Hugs from your use to be neighbor! Wow. What a nail biter that story was. Glad it turned out OK. We missed you for Mardi Gras and, of course, especially at KdV. 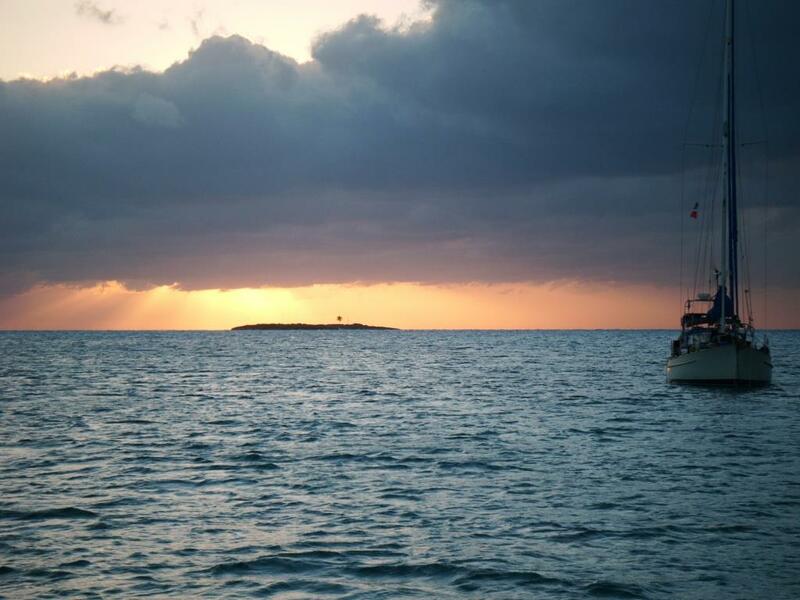 We are currently in the Exumas – we’ll keep a eye out for you. Lol! Cindy is so right! We just made it to Georgetown. Where in the Exumas are y’all?